OPENING OF THE SILVERSTONE WING! Silverstone Circuits Limited, and its owner the British Racing Drivers’ Club (BRDC), today opened the circuit’s state-of-the-art new Pit, Paddock and Conference complex – The Silverstone Wing. His Royal Highness the Duke of Kent, KG, who is also President in Chief of the BRDC, formally opened the new building that represents the second stage of a multi-million pound investment in the Home of British Motor Racing and heralds an exciting new era for British motor sport. 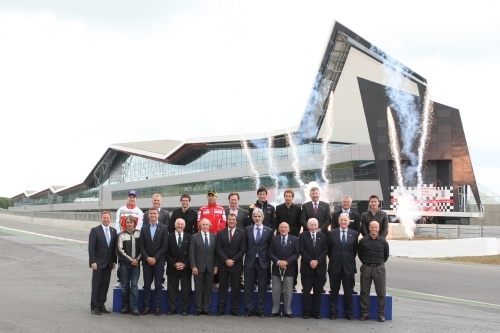 The official opening ceremony took guests on an evocative journey through the history of Silverstone, including appearances by many of the biggest names in the history of British motor sport. Five of Britain’s six living Formula World Champions – John Surtees OBE, Sir Jackie Stewart OBE, Nigel Mansell OBE, Damon Hill OBE and Jenson Button MBE – were in attendance, along with fellow Formula One luminaries, Sir Stirling Moss, Sir Frank Williams, Christian Horner, Ross Brawn, David Coulthard and Murray Walker. The worlds of MotoGP and World Superbikes were also represented at the launch, by a host of Britain’s best riders, including Cal Crutchlow, Jonathan Rea and James Toseland, who showed their support for their home circuit and the stunning new facility. The ‘show’ element of the opening ceremony culminated with a focus on the present and future of Silverstone, which was represented by three current greats of world motor sport. Britain’s most recent Formula One World Champion, Jenson Button, was joined on stage by nine-time World Champion Valentino Rossi, before 2010 Formula 1 British Grand Prix winner Mark Webber brought things to a close by driving his Red Bull Racing Formula One car into The Wing and coming to a stop in the middle of the room. All of the drivers and riders paid tribute to the impressive new facility, which will host its first major motor sport event, the FIA GT1 World Championship, on 03-05 June. This will be quickly followed by three of Silverstone’s biggest events of the year; the AirAsia British Grand Prix (MotoGP) on 10-12 June, the FORMULA 1 SANTANDER BRITISH GRAND PRIX on 08-10 July and the British round of the FIM Superbike World Championship on 29-31 July. More than 800 guests were at Silverstone to witness the formalities, including the great and good of British motor sport, local dignitaries, motor sport governing bodies, BRDC members and media. Following the opening ceremony the guests enjoyed exploring the new complex, which includes 41 garages, a race control building, a podium, media centre, hospitality and VIP spectator zones. With three large halls, a conference facility, business centre and a 100-seat auditorium, the Silverstone Wing has also been designed to accommodate conferences, product launches and experiential events, and will be the largest covered exhibition space between London and Birmingham. “Today was a very important day in the history of the British Racing Drivers’ Club and Silverstone Circuit”, commented Damon Hill. “The official opening of the Silverstone Wing represents the culmination of many years hard work and gives a clear statement of intent for the future. We are honoured that our President in Chief, His Royal Highness The Duke of Kent, KG generously agreed to perform the opening ceremony. “Over the last sixty years, under the stewardship of the BRDC, Silverstone has grown beyond all recognition. Silverstone has a significant historical legacy, but we maintain our place at the forefront of contemporary international motor sport, hosting an array of world class events and activities. This is in no small measure because British competitors have consistently led the way at the highest level of global motor sport for over eighty years. For Richard Phillips, Managing Director of Silverstone Circuits Limited, the launch represents an important stepping stone in the redevelopment of Silverstone. “Building on last year’s successful Grand Prix track upgrade, The Wing is another great milestone in Silverstone’s history and we must recognise and thank the BRDC for having the insight and vision to invest in to the future of the venue as we continue to expand and diversify the business. This building will not only be a wonderful base for our major race meetings, but has the flexibility to accommodate conferences, exhibitions, launches, banqueting functions and experiential events,” said Phillips. John Barrow, Senior Principal of Populous - the design and architecture firm behind The Wing - commented, "This new striking pit and paddock design not only reflects the speed and excitement of racing itself, but it has already become a pioneering landmark and a symbol of Silverstone. We are very proud to have improved one of the greatest circuits in the world and the Home of British Motor Racing." The Silverstone Wing will provide a world-class facility for teams, officials and spectators alike, including 41 garages, a race control building, a podium, media centre, hospitality and VIP spectator zones. It is the largest conferencing venue between London and Birmingham.